The 19th Wife is an expansive, ambitious, and consuming novel, and it’s noteworthy because it successfully and fantastically fulfills those two elusive goals: to entertain and to teach. And indeed, after you read Ebershoff’s work, you feel like an expert in all things Fundamentalist Mormon. 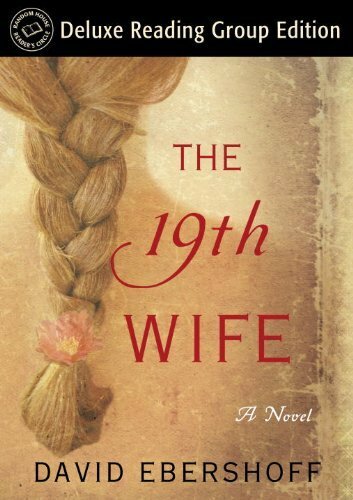 This happens to be my favorite type of novel, though: a blend of history, fiction, and present day hot button events (around my first read of The 19th Wife, hundreds of children in Texas were seized from a polygamy-practicing group, making this novel pretty darn relevant). The book is split into several unique sections, all fictional but historically inspired (Ebershoff is a meticulous researcher). One section includes letters and diary entries; another features a peek at a scholarly paper from a Woman’s Studies Professor at BYU. Her thesis analyzes the life of Ann Eliza along with what her legacy means to the mainstream Latter Day Saints, who have long denounced the way that the Fundamentalists (or “Firsts”) live and practice their faith. This grounds the story a bit and gives readers a view of the Firsts through the lens of a mainstream LDS (the novel is clear that the Firsts do not represent modern day Mormonism – instead, it is an extreme and controversial sect). The primary stories, however, center on Ann Eliza Young, an 18th century wife of Brigham, and Jordan Scott, a broken, hurting young man living the vagabond lifestyle in present day California and Utah. Although Ann Eliza is the historical presence that is weaved throughout the entire narrative (and her descriptions about life in a plural marriage are as interesting and shocking as a reader might hope), Jordan is largely the star of the novel. He projects bitterness and a hardness that stems from his past as a First kid who has been kicked out of the cult and left to fend for himself. At the story’s start, he learns that his mom, one of many plural wives, is in jail for killing his father. He reluctantly but determinedly sets out with Elektra, his canine sidekick, to uncover the truth and reconcile his challenging past with his troubled present. As you can see, this book packs a punch – of information, of history, and of analysis of the human condition. The author was asked why he formatted his research into a novel versus straightforward nonfiction. His answer is that in his opinion, fiction is the best medium to “accommodate (many) conflicting points of view.” In that manner, he is very successful at crafting a fair yet informative, illuminating, intelligent, and altogether engrossing read.